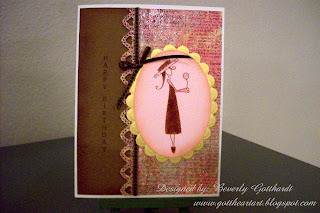 First, I'm still practicing with my lighting, so you can't see very well on the left Happy Birthday is stamped vertically with chocolate ink. Now on with my story. and boy, it looks like it's going to be fun. I think they said a gal is now Queen of Challenges because she got 15 challenges on one card. That's very Queenly--I'm not there yet, but this card is for 3 challenges. I think I bought 2 sheets of it, so you'll probably be seeing it show up some more. I usually manage to get at least one heart on every card I make and this one was no exception. 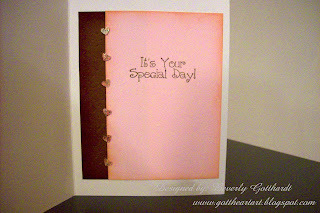 Supplies: Card Blank Ivory 61/2" X 5" Value Pack-Hobby Lobby, brown card stock, Prima Marketing Inc.-Flirty Little Secret Shimmer-Gotta Scrap, Marco's Paper-Stardream Stationary Gold, Stampin Up-pink card stock, Martha Stewart-Heart Border Punch, ribbon-Michael's, Ink: Ranger Archival Ink-Sepia, CTMH-Z2111Chocolate, Z2102Baby Pink, pink gel pen, Sakura Gelly Roll-Clear Stardust, Cuttlebug Embossing Folder-Swiss Dots, Coluzzle Slim Oval cutting template, Stamps: CTMH-D1092 Flower Girls, C1257 Happy Birthday, My Sentiments Exactly-TT208 Birthday Sentiments, glue dots. Thanks for joining in the SimonSaysChallenge. Wowie! What a beautiful card. This is one of my favorite CTMH images. I love your take on this week's sketch. Thank you so much for playing along!! SSSC24-TTC #003-Challenge #4-Button It Up! SUINKWWC 46 & Challenge 66-Wheely Good Fun! MTTSC27 and 365 Cards-Day 108- oh Boy! Sketch #54-6th June-Mandy's DT Week !